After a spontaneous village in the district of Végueta in the Peruvian province of Huaura, an important finding is housed. More than 3000 years buried sandstone were unable to break the record of the first inhabitants of the American continent. Thus, north of the road Panamericana a set of buildings stands frozen in time and waiting to be decoded. So suggest the specialists in charge of the archaeological site Vichama that after its discovery in 2007, has endeavored to meet the particularities of this citadel. On a tour of the area, organized by the Ministry of Environment of Peru, this newspaper was learned, firsthand, some progress in the field. 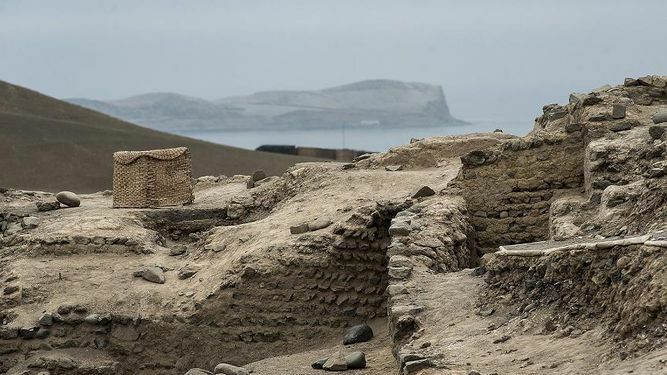 During the journey, the archaeologist and head of field Vichama, Pedro Vargas, said the settlement was found by the Peruvian anthropologist Ruth Shady, recognized by the revaluation archaeological project in the Sacred City of Caral, Peru. A Vichama he is associated with caralina culture, also known as the first Andean civilization. “He participated in the first interaction networks Caral” reports the official site of the Municipality of Végueta, which exposes in the center of that community a permanent exhibition with the findings rescued by the investigators in Vichama. As Caral, the city of Vichama stands as a sustainable settlement for its recycling practices, energy efficiency and building technology. According to archaeologist Tania Abad, the current complex has structures whose functions are still under study. However, to date there have been counted 12 mounds of high-volume, medium height, plus other smaller buildings that have large spaces that could serve for possible domestic activities. Vichama is located in a plaza adjacent to the Halconcillo hills, near the Huaura River and quite close to the Pacific coast. Hence he relates Agriculture and fisheries as a city, for its strategic location between fertile and the coast. During the tour, archaeologists explained that the residents of Vichama were successors to the ancient civilization of Caral was beginning to succumb. That’s why there are many elements similar to those found by Shady in their explorations on the site in the 1990s techniques. As Caral citadel Agriculture and fisheries has models of sustainable construction, designed for an area of seismic recurrence. Buildings of thatch, stone and shicras (vegetable fiber networks) served as the basis for construction, Abad explained, adding that also used waste molluscs and other field activities, to create blends that serve as support for their buildings. The sun, wind and fire, were the main sources of energy. While the products of the land and marine-derived protein, represented their food pyramid. A severe drought meant to civilization a problem that could put their food security and quality of life at risk. Thus Vichama researchers assume, after the discovery of a series of figures in high relief clay. The carvings, which have been found since 2009, could, according to the specialist, revealing the possibility of a period of drought or famine could whip the village. The remains, as disclosed in the depths of a ceremonial temple within the complex Vichama, show a series of friezes and human figures of about 1.70 meter height in an alleged ritual “where visibility of the suffered food deficiency becomes” said Abad. Although explorers still continue research on this hypothesis and the exact time it happened, until it is presumed that the drought could have broken out in the last period of the village, about 100 years, probably. On the other hand, another finding at the top of this temple shows the relief of a frog or toad in the forehead lashed by lightning, which, as explained by archaeologists, could be the start of a rainy period that would end phase hot season. This last image, according Abad, could be interpreted in this way, because in the Andean worldview toad is related to the water. Caral complexes and Vichama are contemporaneous with other ancient civilizations such as the Chinese, Egyptian and Mesopotamian, for its architectural complexity organized pyramidal buildings, squares and urban practices defined. Guided tours are available for tourists and people interested in learning more about both towns, at an approximate cost of 11 soles (US $ 3.70) routes.